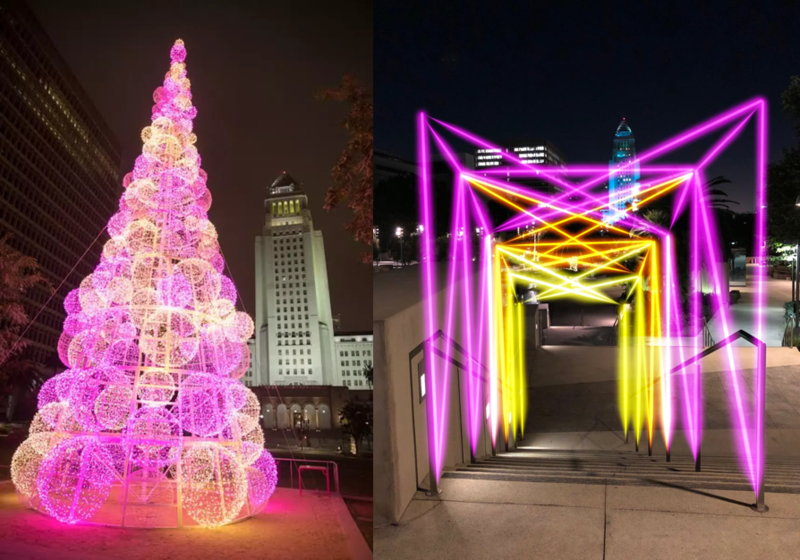 This week and next, you can: experience the glow of the season at two DTLA public spaces; remember the villains, victims and heroes of the movie Die Hard; discover Skid Row art; walk through the architectural legacies of Pasadena; cruise the majesty of Christmas past and present in Altadena. A color-defying modern twist on a Christmas Tree (left); “The Net (Neon Network)” by H+ Creative (right), a pair of neon-hued light tunnels draped over the stairs. You can take advantage of December’s early nights at the first ever Grand Park interactive nighttime experience, where you can touch, climb and explore 22 illuminated installations that complement the park’s traditional holiday decorations. The 12-acre art, projection and light display features works from local artists and organizations, including “A Spark of Light” by Aphidoidea and a light and water show at the Arthur J. Will Memorial Fountain, both which allow guests to change the piece’s activation through touch sensors. Organizers suggest that the exhibition is not quite a destination on its own, but if you’re in the area, it’s worth an evening stroll through the park. That said, you might consider a double destination experience on Friday: After working your way through Grand Park, find your way over to Union Station for their free Cocoa Concert series where you can listen to live music and drink hot cocoa amidst the splendor of this historic Spanish Colonial Revival and Art Deco building, beautifully decorated for the holidays. Movie time: Christmas Eve 1988, a group of German terrorists seized a Century City building to steal millions in bearer bonds from Nakatomi Trading. Spoiler: Off duty detective John McClane saves the day. The Christmas party gone wrong action film Die Hard is an unlikely yet perennial holiday favorite, with fans enjoying seasonal screenings with a cult-like passion. In the movie, a group of German terrorists seize a Century City building on Christmas Eve to steal millions in bonds from finance firm Nakatomi Trading; the hostages’ only hope is the superhuman efforts of off duty detective John McClane. Returning to the Century City Fox Plaza setting for that dramatic night, this year organizers are taking the annual gathering to another level with a 30th anniversary candlelight vigil where you can join the remembrance of villains, victims and heroes of this epic event. Organizers will have candles, and all attendees are encouraged to bring items to memorialize the sidewalk outside the building. You can read more about the movie and join the Facebook community here. Yippie-Ki-Yay. 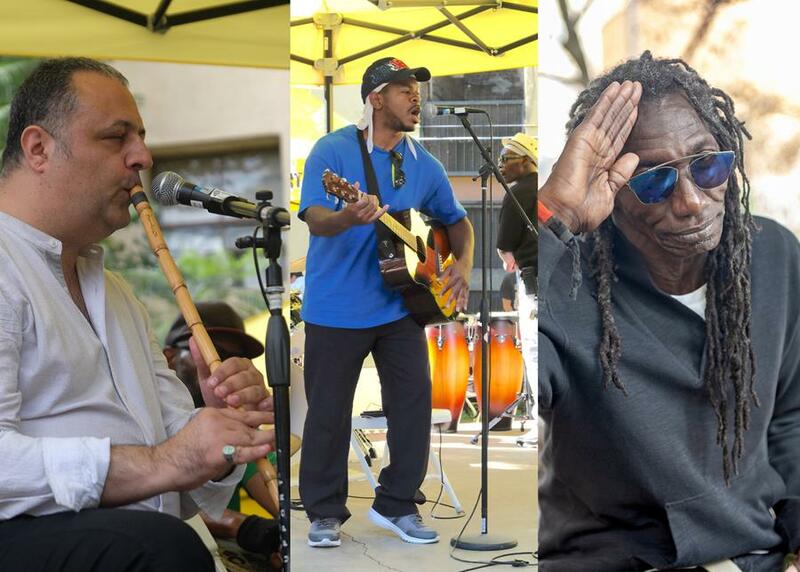 Ten years after the first survey of artists in Skid Row, and the subsequent initiation of several programs to improve access and arts culture for residents, the Los Angeles Poverty Department checks in on the current environment for artists with the exhibition State of the Art: Skid Row, along with a community conversation exploring how to further improve opportunities. In the 10 years since the original study, several programs and initiatives have been implemented, with recorded participation of over 700 artists, 130 of whom are identified in photos, posters and videos in the exhibition. Programs and initiatives since the original study include: The Festival for All Skid Row Artists, started in 2010, an annual two-day event featuring day long performances, workshops and exhibitions; The Skid Row History Museum & Archive, started in 2015 as a dedicated community exhibition, performance, community space – it also houses an expanding archive of Skid Row history; Studio 526 Arts Center, a painting and music studio; The Skid Row Parks Committee has partnered with the City Department of Parks and Recreation to produce a film series in Gladys and San Julian Parks; and LA Community Action Network, has purchased a building on 6th Street, which is now the site of a number of cultural activities. You can read the original study, Making the Case for Skid Row Culture, co-authored by Maria Rosario Jackson of The Urban Institute and John Malpede of the L.A. Poverty Department here. When: Conversation Saturday, Dec 22, 5 – 8 pm; Exhibition runs through Dec 29, Thursdays – Saturdays, 2 – 5 pm. The 1927 Pasadena City Hall designed by John Bakewell & Arthur Brown features a red tiled roof, an ornate fountain, and a garden courtyard. Pasadena Heritage invites you and your holiday guests to take a walking tour featuring many of Pasadena’s architectural treasures. There are two tours: Pasadena Hillcrest Neighborhood and Civic Center District and Fountains. Both are being offered at 10 am and 1 pm, so if you have a lot of stamina and some great walking shoes, you can go on both tours and make a full day of it! One of Pasadena’s most beautiful neighborhoods, the Pasadena Hillcrest neighborhood tour explores various architectural styles of custom homes in the Oak Knoll subdivision, several grand estate mansions, and finally a number of Craftsman style homes such as Freeman House (designed by Arthur and Alred Heineman) and Culbertson and Blacker Houses (designed by Charles and Henry Greene). 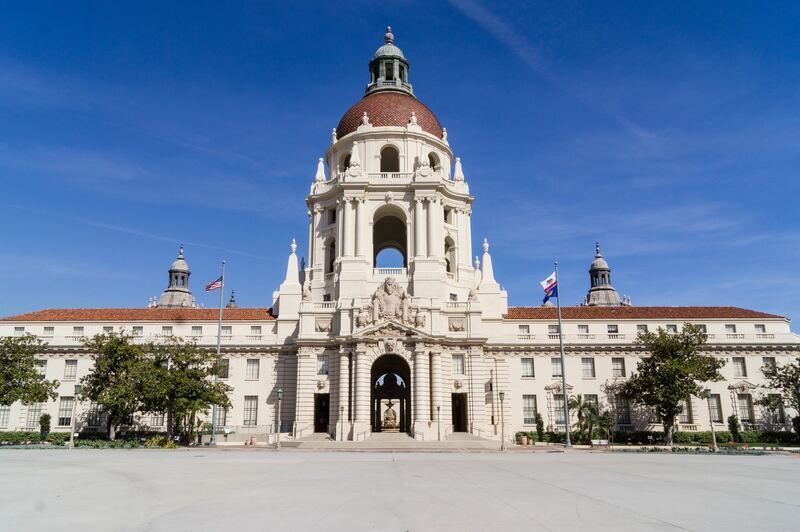 Pasadena’s Civic Center District is a product of the “City Beautiful” Movement, which was started in Chicago in 1893 by renowned planner Daniel Burnham. In 1925, Edward H. Bennet, a protégé of Burnham’s, created Pasadena’s “City Beautiful” plan, which would go on to win a National Planning Landmark Award in 2012 for the Mediterranean architecture of this beautiful civic core. The tour will tell stories of the implementation of the plan over many years, including anecdotes of individual contributors such as Julia Morgan who designed the former YWCA building, and George Ellery Hale who was a driving force keeping the plan in motion. Also on the tour are several fountains, some of which were designed by great Pasadena artists and landscape designers such as Ernest Batchelder, Myron Hunt, and Ruth Shellhorn. Where: Meeting location Civic Center District and Fountain Tour: The Postcard Fountain at the Paseo 300 E. Colorado Blvd. ; Meeting location Hillcrest Neighborhood Tour: The sidewalk in front of 1233 Wentworth Ave.
Tickets: $15-$20. You can get more information and tickets here. Take a break from the over-the-top, Instagram-ready, selfie destinations this holiday season and cruise the majesty of Christmas past and present on a slow road through Altadena. A near century-old tradition, community volunteers – with a budget of $12k – $17k raised through membership dues, donations and sponsorships – annually string colored lights over 136 towering cedars lining nine blocks of Santa Rosa Avenue. Perhaps not the bling experience of other destinations where each neighbor outshines the next, Altadena’s Christmas Tree Lane is an old-fashioned, understated reverence to the old trees and the just-as-old traditions of the season, so much so that the lane itself is listed as a California Historical Landmark and on the National Register of Historic Places. Keeping the tradition alive (literally) has been a community effort. While drought, root fungus, heavy winds and other hazards have threatened the majestic trees over the years, the lane’s supporters have been avid stewards of these treasures and up to half of the existing trees are still from the original 1885 planting. While it really is “all about the trees,” on certain nights, there is also a home on the lane tricked out with model trains and open to the public. 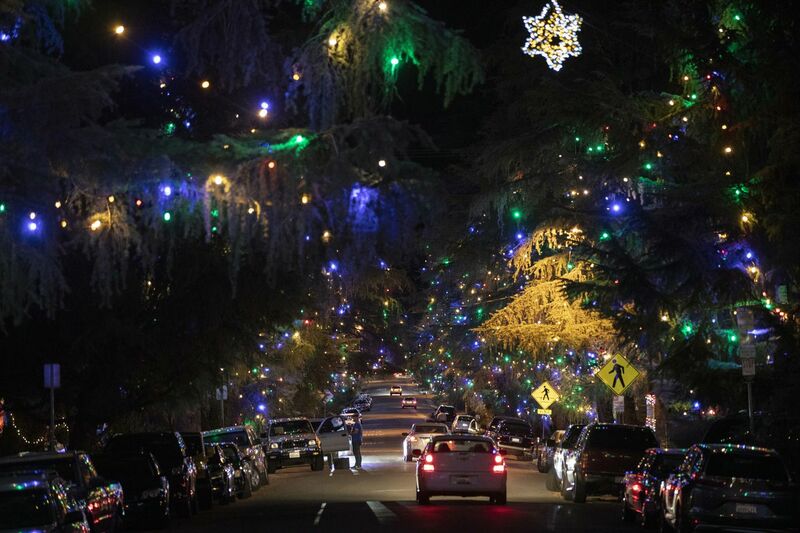 You can read more about the history of Altadena’s Christmas Tree Lane here.